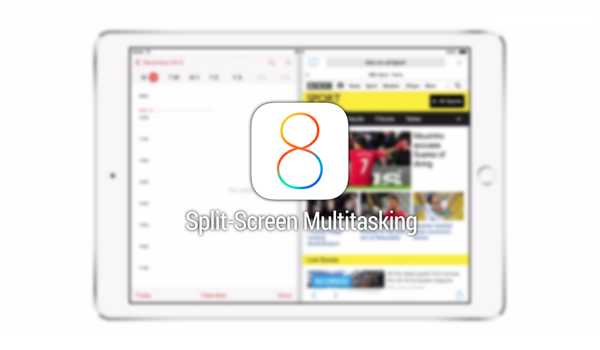 Before Apple announced iOS 8 at WWDC, there had been plenty of chatter that a new split-screen mode was on its way to the iPad which would allow two apps to run side-by-side in a similar way to the feature offered by Microsoft’s Surface tablet. As the opening keynote of WWDC came and went, no mention was made of this rumored feature, but now that iOS 8 is in the hands of developers, mention of the split-screen mode has been found throughout the Software Development Kit that Apple provides. With then news that Apple is indeed at least considering a split-screen mode for apps running on an iPad, developer Steve Troughton-Smith set about trying to find it. If your memory is a good one, you may recall that Troughton-Smith is the man that found the CarPlay interface hidden inside iOS 7, so he’s got form for this sort of thing and, sure enough, he’s managed to get apps to run in a split-screen configuration in the iOS simulator on a Mac. More accurately, he’s managed to get an app to run on a portion of the screen, rather than filling it. Being able to actually run two apps at once currently alludes him, but we wouldn’t be surprised if he managed it sooner or later. In its current state, the simulator allows a two-fingered dragging gesture to resize the currently running app so that it takes up either 1/4, 1/2 or 3/4 of the screen, leaving the remainder for, we presume, another app. This added functionality may not have been announced at WWDC because Apple is waiting for new, higher powered or simply larger iPads to be announced that can take advantage of the feature. With that not expected until later this year, it’s possible Apple is trying to keep the feature quiet until then. It’s also possible that the feature has been canned but not stripped from the beta build of iOS 8 as yet. We’d love to see true side-by-side multitasking come to iOS and the iPad though, so we’ve got all our digits crossed that the feature hasn’t been canned at all.